The Kensington modern 5 light polished chrome dual mount chandelier is sweeping, contemporary and stylish. 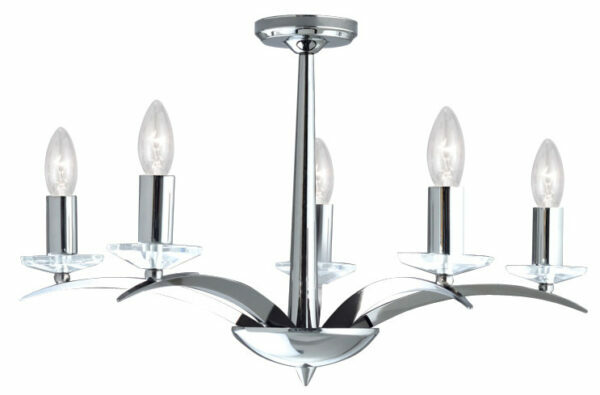 A contemporary polished chrome finish 5 lamp ceiling light with sleek curved arms and cut glass sconces. Shown here as a semi-flush ceiling light fitting, it is supplied with a chain and central drop rod so that it can be fitted either as a semi-flush or as a pendant. The Kensington chandelier features clean sweeping lines in polished chrome, taking this design to new heights of glamour. The sleek curved arm fittings with five cut glass sconces reflect a refined style which would make a stylish and desirable addition to any living space. The chain suspension is fully adjustable for different ceiling heights, please see below for dimensions.